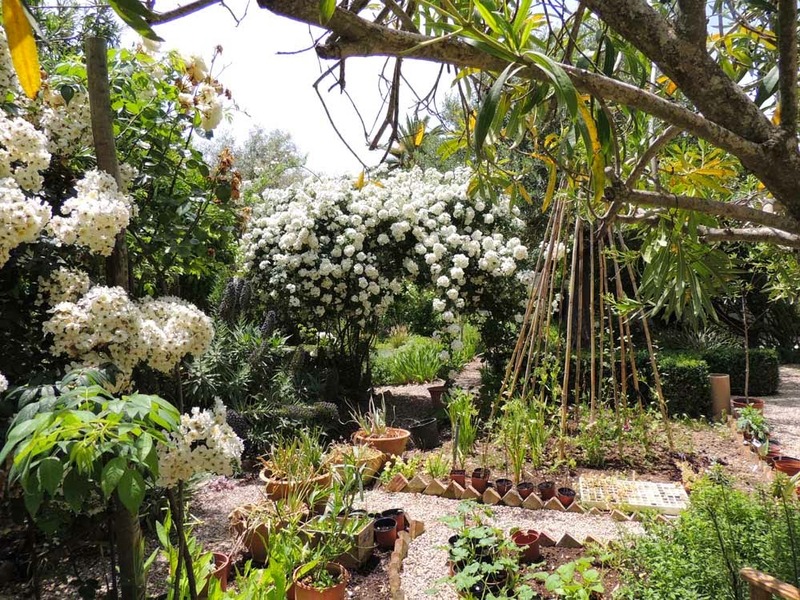 Our last garden in the UK was a small town garden with brick walls and hot sandy soil which dried out quickly, hence the interest in mediterranean plants. The only rose which we managed to grow successfully was the lovely Rosa banksiae lutea, long arching thornless branches which are smothered in clusters of small double soft yellow flowers in early summer. Named for the wife of Sir Joseph Banks, the Director of Kew, it was introduced into England from China as long ago as 1824 but it is not completely hardy. It is a vigorous climber and will reach a height of at least six metres (20 feet) on slender branches. There is a very beautiful double white variety, ‘Alba Plena’, also white and yellow single varieties but they do not have the same allure, nor are they as prolific. The only disadvantage of Rosa banksiae is that it does not flower when very young and takes a year or two to get into full swing. So successfully did we grow this rose that I had to occasionally check with the neighbours that they also liked having it on their garden walls ! It was the obvious choice to try in our new garden here on the Algarve and it has done well here too. You might occasionally have seen it growing on wire fences or through trees in gardens here. 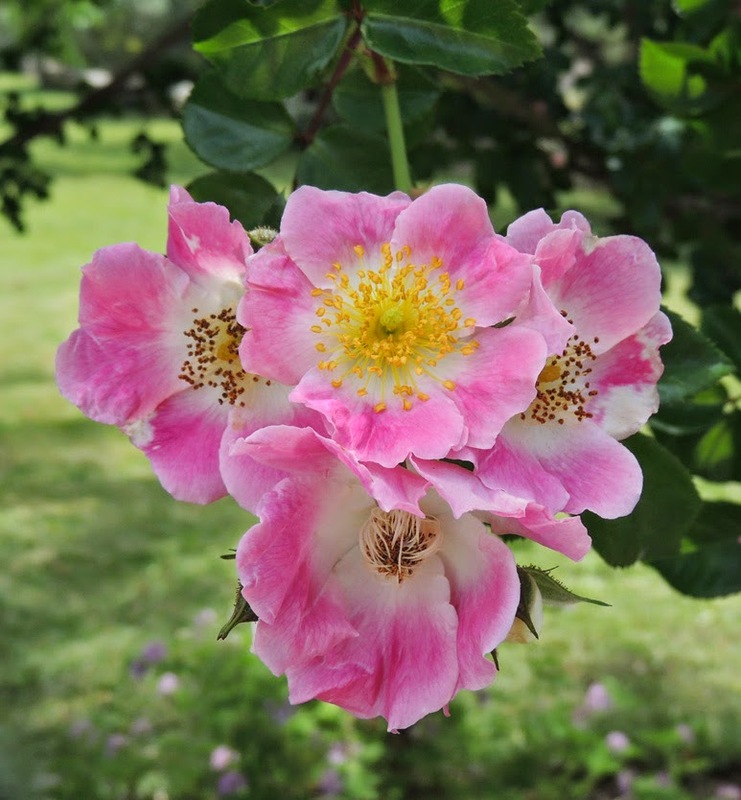 There are some roses which will flower throughout the spring and summer. Known as ‘repeats’ they are much sought after. Unfortunately many of the hybrid roses do not grow well here and are the cause of much heartache, and not a little cursing, as they shrivel and sulk in the heat. Careful choice is needed for a successful display of the world’s favourite garden plant family – roses. 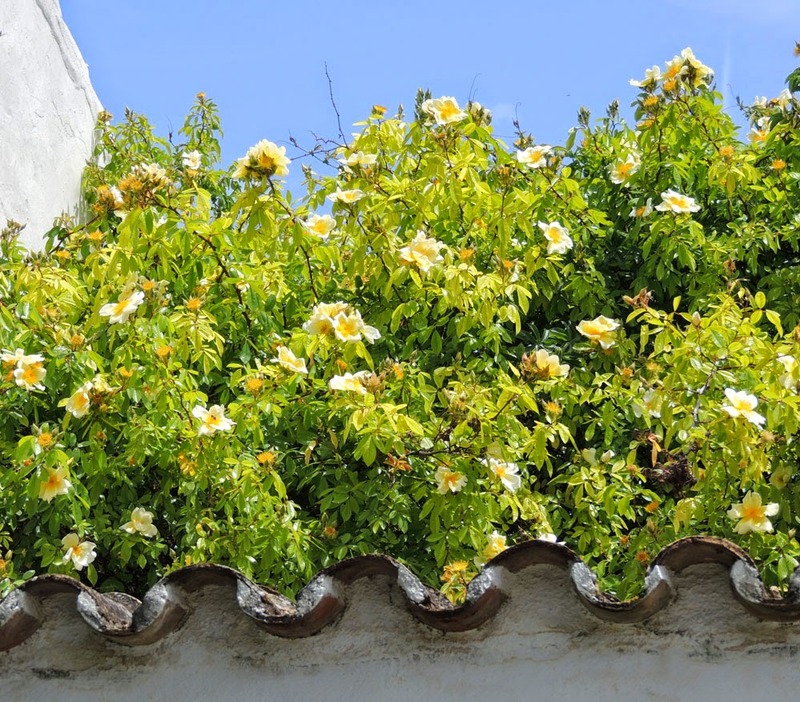 Many Mediterranean climate gardeners find that the climbers and shrub roses do best. As in many other plant choices, local varieties can give the best results. Don’t be afraid to try cuttings from those roses that you see, and like, locally. You might be rescuing an old variety. 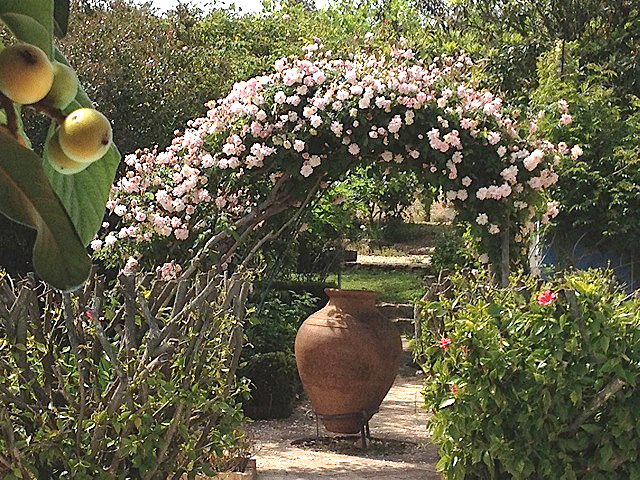 Recently I was lucky enough to visit a house and garden near Bordeira in the Barrocal area of the central Algarve. 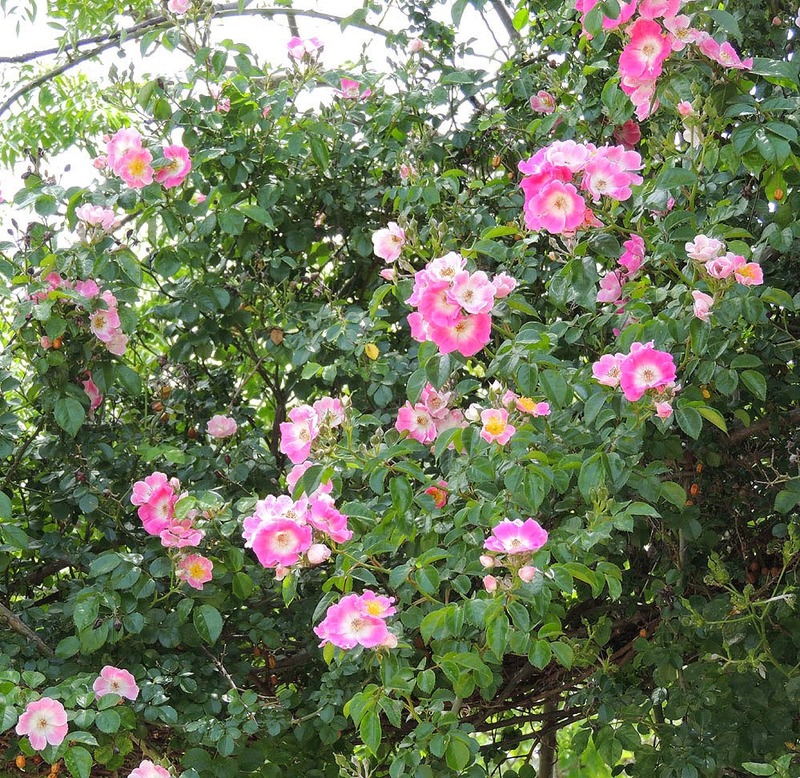 The house has been owned by the same family for about 25 years and the wise initial plantings of some spectacular climbing roses was at its peak in May. Enormous cascades of crowded flowering stems were swallowing outbuildings and garden supports – and then there was the perfume !! Mairin told me that she had brought some roses from England and had some that were sourced locally. The lovingly restored old house had many opportunities to show off roses, covering a shallow tiled roof over the barbecue area with peach coloured blooms was particularly effective. The house is in a small valley and so the soil looked very fertile but this may have been down to the generous use of the home made compost ! There were interesting corners with plants inserted into planting pockets left in the hard surface, a great way to encourage climbers to get their roots under the cool traditional paving. As you enter through the dark blue courtyard entrance doors, there is a huge swathe of Trachelospermum jasminoides and the perfume from this shower of small white flowers was fabulous. The vistas from the house out into the garden took in the vegetable plots planted out under huge old fig trees. Shady conditions for the ‘potager’ providing fresh beans, lettuce, onions etc. and all laid out to provide good colour contrast and interest for the garden visitor as well as the chef ! A very ‘French’ concept transplanted to the Algarve. There is a hectare of land part of which is an organic vegetable garden and part being made into a culinary and medicinal herb garden. There is also an area of flower garden which has been more northern European than Mediterranean up till now, Mairin is gradually changing this to better adapted planting. The axis of the main paths runs through the flower gardens and on into raised beds for vegetable growing so the journey through the garden was full of variety and interest. This is a garden which beckons you on to explore down the pathways to see what awaits you around the next corner. At the moment the roses are the triumphant attention grabbers, but the lovely home grown lettuces I took home with me were reminders that this garden is good for the soul and for the taste buds! For more information on roses, there are good mail order catalogues and web sites, David Austin Roses in the UK, Meilland Selection U.K. Peter Beales web site http://www.classicroses.co.uk is a good place to start – their catalogue is virtually a hand book on rose growing and very helpful in identifying roses. Choose your planting position well and avoid competition from nearby plants, feed and water to establish young plants and you can be rewarded with that WOW factor which comes from a well grown climbing rose.